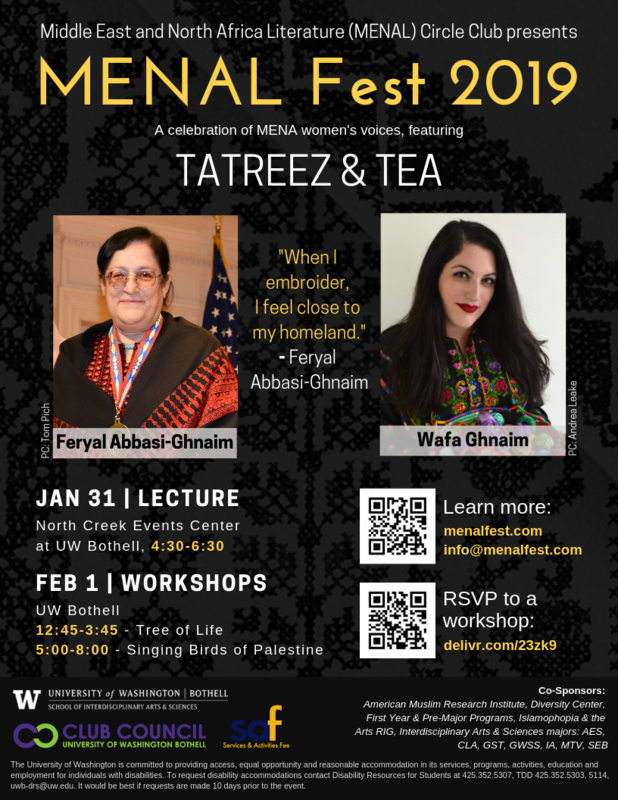 Thursday, Jan. 31, 2019, 4:30 – 6:30 p.m.
MENAL Fest is proud to feature Tatreez & Tea as the first annual keynote speakers for MENAL fest! Learn about the centuries-old tradition of Tatreez (Palestinian Embroidery) and the meanings it carries from generations past and today as a symbol of resilience. MENAL Circle is a club at University of Washington Bothell that seeks to provide a safe space for students and campus community to engage with States-based local and international women writers and artists with connections to the Middle East and North Africa (MENA). These voices are not normally highlighted in the mainstream Western culture. This project aims to connect beginning as well as established writers and artists with connections to MENA and furthermore engage participants with these writers through a variety of experiences.